a SML - You will be tested by a written examination and a performance evaluation. a ACC - You will be tested by a written examination and a performance evaluation. The belayer establishes an anchor system (a strong attachment point to the mountain) and takes a stance (bracing against the terrain to resist a hard pull on the rope). b| Rope is paid out as the climber advances, keeping a minimum of slack between the roped team so that any fall will be stopped as short as possible. 3 If the climber falls, the belayer will apply the brake with the use of a belay device. d Upon reaching the top, the lead climber will establish a belay stance to top rope up the number 2. NOTE: Alertness and appreciation for the importance of the belayer's role is critical. A leader belayed by a novice without the knowledge and training in belay techniques would be wise to climb as if there were no belay at all. TRANSITION: Now that we have discussed the concept of belaying, are there any questions? Let's discuss methods and types of belays. 2| (5 Min) TYPES OF BELAY ANCHORS. There are two basic types of belay anchors: Indirect and Direct. a Indirect Belay. The term stems from the fact that the belayer's position is between the anchor point and the climber, therefore absorbing some of the Impact Force in the event of a fall. So the force of the fall goes indirectly to the belay anchor point through you. b. Direct Belay. The direct belay exerts the Impact Force of a falling climber directly to the belay anchor point. The belayer is not in the system but still remains in control of the belay device. TRANSITION: Now that we have discussed the types of belays, are there any questions? Let's discuss the elements of a belay chain. 3| (5 Min) ELEMENTS OF A BELAY CHAIN. There are three principle elements of a belay chain used in rock climbing: the Anchor, the Belayer and the Climber (ABC). The Anchor. The anchor is a term used to describe the method by which the belayer attaches himself (with the rope or additional equipment) to the mountain so that he cannot be pulled off his belay stance. The anchor can be either an indirect or a direct belay using either natural or artificial points, or a combination of both. JgWhen using natural anchors during climbing operations, a minimum of two natural anchor points will be utilized. ^gWhen using artificial anchors during climbing operations, a minimum of three artificial anchor points will be utilized. )If constructing an anchor system in which only one natural anchor can be located for use, it must be backed up by two pieces of artificial protection. Anchors on the bottom should normally be behind the belay man and at or below his waist, terrain permitting. Anchors on the top should be at waist height or above, terrain permitting. 9 The Belayer. The term belayer is used to describe the static climber's mission of providing security with a rope to the lead climber in case of a fall. HfiThe belayer should position himself as near to the climbing route as possible to prevent the "Zipper Effect". This is covered in ALTERNATIVE BELAYS AND ANCHORS. ^gWhen using the indirect belay stance, the belayer should secure himself snuggly between the anchor and the climber to absorb some of the Impact Force and to prevent any possible dragging, which could possibly jar the brake hand off the rope. ^gWhen using the direct belay stance, the belayer should ensure that the anchors could support a Factor Two fall. This is covered in PARTY CLIMBING. ^gWhen belaying from above, ideally the belayer should try to establish a sitting belay stance. laces protection into the rock through which the rope is passed through so that in case of a fall, the length of the fall is reduced. stablishes the top anchor belay to bring up the number 2. TRANSITION: Now that we have discussed the elements of a belay chain, are there any questions? Let us discuss the establishment of a belay. Ensure that the anchors are sound and in conjunction with the direction of pull. 3 Locate the exact position of where he will be belaying the lead climber. This is known as the belay stance. d Ensure that the climbing rope is back stacked near the belay stance. a With his respected end of the climbing rope, tie a retrace figure of eight into the hard point of his harness. TRANSITION: Now that we have discussed the responsibilities of the belayer before a climb, let us talk about establishing the belay. Establishing a Natural Anchor Belay Stance Using the Rope. This method is desired when the anchor points are near by. Minimum amount of equipment is necessary to build this system, but it may require the use of a lot of rope. remote. The remote allows the belayer to escape the anchor system if necessary. This will be covered in RESCUE FOR PARTY CLIMBING. ^ From the remote, take a bight of rope and place it around the furthest natural anchor point then back to the belay stance. nsuring that the rope is taut, tie an over the object clove hitch with the bight of rope and clip it into the MAC. rom the clove hitch on the MAC, take a bight of rope and place it around the second natural anchor point then back to the belay stance. jThe climber is now in a secure belay stance. He will sound off with the command 'Off Climb". e will now clip another steel locking carabiner into the MAC. This will serve as the belaying carabiner to attach the belaying device to. BWith the live rope near the lead climber's retrace figure of eight, attach it to the belay device ensuring that the belaying carabiner is locked down when complete. ®The #2 is now ready to belay the lead climber. a Establishing a Natural Anchor Belay Stance Using Slings / Runners. Using slings / runners will shorten the distance to the anchors points when they are further away. More equipment will be necessary to build this system, but it may require less rope to construct. 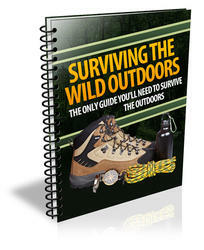 ¡Place a sling / runner around the furthest natural anchor point with a non locking carabiner. ¡Attach a MAC onto the retrace figure of eight. ¡¡With the rope from the retrace figure of eight loop on the harness, attach it to the furthest natural anchor point ensuring that there will be slack in the rope. This will enable him to escape the system if needed. ¡With the rope from the natural anchor point, return to the designated belay stance. ¡Ensuring that the rope is taut, tie an over the object clove hitch and clip it into the MAC. ¡From the clove hitch on the MAC, take the rope and clip it straight through the second natural anchor point and return to the belay stance. ¡Again ensuring that the rope is taut, tie an over the object clove hitch and clip it into the MAC and lock down the carabiner. The climber is now in a secure belay stance. He will sound off with the command Off Climb". ¡He will now clip another steel locking carabiner into the MAC. This will serve as the belaying carabiner to attach the belaying device to. (With the live rope near the lead climber's retrace figure of eight, attach it to the belay device ensuring that the belaying carabiner is locked down when complete. ]The #2 is now ready to belay the lead climber. 3 Establishing an Artificial Anchor Belay Stance. When no natural anchor points are available, the #2 will establish the belay stance utilizing at least three pieces of artificial protection. All three pieces of protection will be placed in the direction of pull. NOTE: Special considerations for anchors established on ledges and during amphibious assaults will be discussed in ALTERNATIVE BELAYS AND ANCHORS. lace the three pieces of artificial protection into the rock, keeping in mind the anticipated direction of pull if the lead climber fell. Ideally the # 2 would place the three pieces behind him, below the waist and spaced out evenly. ^^Attach a MAC onto the retrace figure of eight. ^||With the rope from the retrace figure of eight loop on the harness, attach it to the furthest artificial anchor point with an over the object clove hitch ensuring that there will be slack in the rope that returns to the climber. This will enable him to escape the system if needed. NOTE: Runners and slings are not required but can be used for extension purposes. ^HWith the rope from the artificial anchor point, return to the designated belay stance. nsuring that the rope is taut, tie an over the object clove hitch and clip it into the MAC. rom the clove hitch on the MAC, take the rope and clip it straight through the second artificial anchor point and return to the belay stance. ^Again ensuring that the rope is taut, tie an over the object clove hitch and clip it into the MAC and lock down the carabiner. ^Attach a non locking carabiner into the MAC. ^)From the second clove hitch on the MAC, take the rope straight through the third piece of artificial protection and attach it to the non locking carabiner on the MAC with an over the object clove hitch. ®The climber is now in a secure belay stance. He will sound off with the command "Off Climb". KWith the live rope near the lead climber's retrace figure of eight, attach it to the belay device ensuring that the belaying carabiner is locked down when complete. The #2 is now ready to belay the lead climber. NOTE: Whenever using artificial protection, slings / runners are not required but can be used for extension purposes. Always keep in mind not to disturb the direction of pull when using slings / runners. d Establishing an Anchor Belay Stance using both Natural and Artificial Anchors. If constructing an anchor system in which only one natural anchor can be located for use, it must be backed up by two pieces of artificial protection. The method of constructing this system will be the same as constructing an artificial anchor belay stance. TRANSITION: Now that we have discussed how to establish a belay stance, are there any questions? 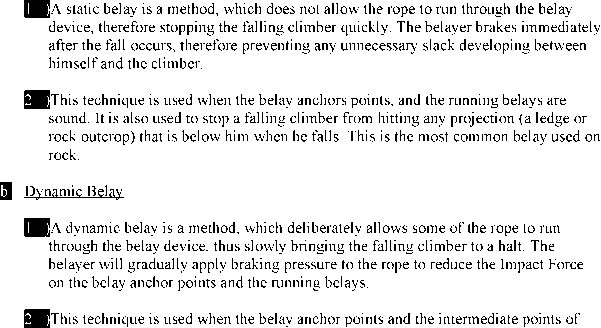 Let us now talk about methods of belaying a fall. 6| (5 Min) METHODS OF BELAYING A FALL. 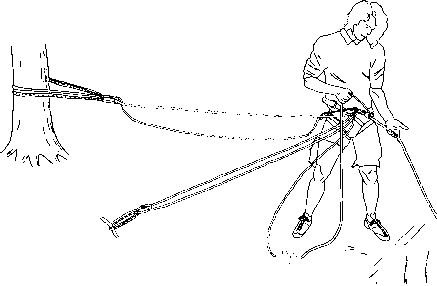 There are two methods of belaying a lead climber's fall: Static and Dynamic. protection are not very sound. It is mostly used when ice climbing, although the technique is widely used when climbing unstable rock. TRANSITION: Now that we have talked about the methods to belay a fallen climber, let us discuss the disassembly of the belay stance. a. Remove the live rope from the belay device and wait until the next command of "Up Rope". g The lead climber will pull up the rope until it becomes taut against the MAC of the #2. 3 The #2 will give the command "That's Me". This informs the lead climber to secure the rope to his belay device. d After securing the climbing rope to his belay device, the lead climber will give the command "On Belay". e. The #2 will now disassemble the belay stance in reverse order of the way it was constructed. Ensuring that lead climber continues to take the slack out of the rope after each anchor removed. f After all the anchors have been removed, the #2 will ensure that all the gear is stowed properly and that the nut pick is readily available. g. The #2 will now give the command "Climbing". h The lead climber will answer back with the command "Climb Climber". i| The #2 will begin to climb. At this time, the roles are switched. The belayer will become the climber and the lead climber will become the belayer. TRANSITION: Now that we have discussed the disassembly of the belay stance, are there any questions? Let us now talk about retrieving the protection. a. When the he reaches a piece of protection, he will sound off with the command "Point", this informs the belayer to set the brake with the belay device. b| The belayer will answer back with the command "Point", to ensure the climber that he has set the brake. Q The #2 will remove the protection and stow it away on his rack. If the piece of protection becomes difficult to remove, he will utilize the nut pick. d After stowing the protection, he will sound off with the command "Climbing", this informs the belayer that he has removed the protection and that it has been properly stowed. HIMake himself secure by moving 10 feet back for the edge of the climb or attach himself to an anchor point. ^®Stop and exchange/reorganize climbing gear with the lead climber for next pitch, and then continue climbing. TRANSITION: Now that we have discussed retrieving the protection, are there any questions? Multi-pitch climbs require the belayer to establish a belay stance during the climb. Let us now talk about the belay method known as hanging belays. (10 Min ESTABLISHING A HANGING BELAY STANCE. Multi-pitch climbs require the climber to establish a belay stance midway through the climb. Since it takes approximately 15 feet of rope to construct a hanging belay, constant awareness of the amount of rope used during the climb must be acknowledged. This can be accomplished through communications between the climber and the belayer. 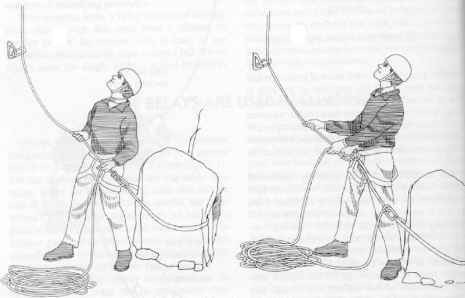 Constructing the hanging belay stance is basically the same as an artificial anchor belay stance with a few considerations. a. When the belayer has approximately 25 feet of live rope left to pay out to the climber, he will sound off "Twenty Five Feet". This informs the climber to begin looking for a belay stance. 9 The climber will begin to locate a good position to establish the hanging belay stance understanding that he will use approximately 10 to 15 feet of rope to construct the belay stance. 9 Once a position has been located he will sound off with the command "Point", this informs the belayer to set the brake with the belay device. d The belayer will answer back with the command "Point", to ensure the climber that he has set the brake. e. The climber will begin to construct his belay stance by placing a piece of protection in the downward direction of pull at approximately chest level to the climber or higher, but within arms reach. f With the rope from the retrace figure of eight loop on the harness, attach it to the piece of protection with an over the object clove hitch. g. The climber will attach a MAC onto the retrace figure of eight. h. Ensuring that the rope is taut from the piece of protection, tie an around the object clove hitch and clip it into the MAC.
] The climber will place a second and third piece of protection, again in the downward direction of pull at approximately chest level to the climber or higher, but within arms reach. H From the clove hitch on the MAC, the climber will take the rope and clip it straight through the furthest piece of protection and again ensure that the rope is taut, attach it on to his MAC with an around the object clove hitch and lock down the carabiner. k. The climber will now attach a non-locking carabiner into the MAC.
] From the second clove hitch on the MAC, the climber will take the rope straight through the third piece of protection. m Again ensuring that the rope is taut, attach it to the non-locking carabiner on the MAC with an over the object clove hitch. Q The climber now will place his fourth piece of protection in the upward direction of pull at approximately waist level to the climber or lower, but within arms reach. NOTE: The principle behind this is so that when the #2 climber passes the belay stance and becomes the lead climber, this fourth piece of protection will prevent the belayer from being pulled upward if the leader falls. o. From the clove hitch on the non-locking carabiner, take the rope and attach it to the forth piece of protection with an over the object clove hitch. p. The climber is now in a secure belay stance. He will sound off with the command "Off Climb". q. He will now clip another steel locking carabiner into the MAC. This will serve as the belaying carabiner to attach the belaying device to. 9 The climber will pull up the rope, ensuring to back stack it carefully to prevent unnecessary entanglement. H Once the climber receives the command "That's Me", he will attach the live rope to the belay device ensuring that the belaying carabiner is locked down when complete. t. The climber is now ready to belay his partner and will sound off with the command "On Belay". TRANSITION: Now that we discussed hanging belay, are there any questions? Let us now discuss the changing over of gear during a climb. RBI (5 Min) CHANGING OVER GEAR. The most efficient method of multi-pitch climbing is for a pair of climbers to alternate leading pitches. At each belay stance the climbers will have to change over and reorganize the gear for the next pitch. When the #2 climber reaches the belay stance, the #1 climber will tie off the belay device and connect a web runner from his donut to the #2 climber's donut. Now the #2 climber is effectively secured so that the gear can be changed over. TRANSITION: Are there any questions over changing over the gear? With the basics you have learned you should have little trouble in understanding the mechanics of an effective belay. If you have no questions for me, then I have some for you. Q What is the minimum number of anchors used in a natural anchor? A Two. Q| What is the minimum number of anchors used in an artificial belay anchor? A Three. a. We have discussed belaying considerations, types of belays, methods of belays, components of a belay chain, the methods of anchoring, and how to tie in to the anchors. b Those of you with IRF's please fill them out and turn them in to the instructor. We will now take a short break.